Britain’s flying ambassadors – the 35th Squadron of the RAF – landed at their airfield in this little Cambridgeshire village in a gale today, after their good will tour of America. 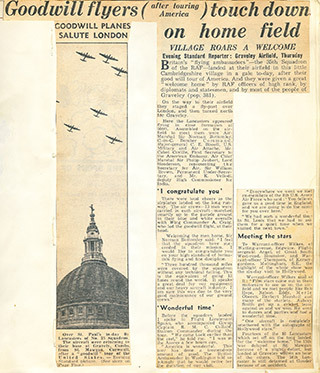 And they were given a great welcome home by the RAF officers of high rank, by diplomats and statesmen, and by most of the people of Graveley (pop 381). On the way to their airfield they staged a fly past over and then turned North for Graveley. Here the Lancasters appeared flying in close formation at 500ft. Assembled on the airfield to meet them were Air-Marshal Sir Norman Bottomley C-in-C Bomber Command, Major-general CE Bissell, US military and air attaché. Mr Cabot Coville, first secretary to the American embassy, Air chief Marshal Sir Philip Joubert, Lord Henderson, representing the Secretary for Air Sir William Brown, permanent under Secretary and Mr K Vellodi, deputy High Commissioner for India. There were loud cheers as the airplanes landed on the long runway. The air crews – 13 men were carried in each aircraft – marched smartly up to the parade ground in their blue and white overalls with Wing Commander A Craig, who led the goodwill flight, at their head. Welcoming the men home, Sir Norman Bottomley said: I feel that the squadron have succeeded in their mission. I would like to congratulate you on your high standard of formation flying and fine discipline. Three hundred thousand miles were covered by the squadron without any technical failing. This is the equivalent of going 22 times round the world. It speaks a great deal for our equipment and our heavy aircraft industry. I am sure this was due to the very good maintenance of our ground crews. Before the squadron landed I spoke to Flight Lieutenant Spann, who accompanied Group Captain RMC Collard Station Commander during the tour. We came back earlier than the rest, he told me, I was in the Azores a few hours ago, America is wonderful. This tour has done a tremendous amount of good. The British Ambassador in Washington told us jokingly that he would retire for the duration of our visit. Everywhere we went we met ex-members of the 8th US Army Air Force who said: You fellows gave us a good time in England, and we are going to do the same for you over here. We had such a wonderful time in St Louis that we had to ask them for a quiet time when we visited the next town. To Warrant-Officer Wilkes of Wartling Avenue, Edgware. Flight Sergeant Angel of Great South West Road, Hounslow and Warrant Office Thompson of Kersey Gardens, Mottingham SE the highlight of the whole show was the six day visit to Hollywood. Warrant Officer Wilkes said of it; Film stars came out in their motor cars to see us on the airfield and we met people like Bob Hope, Nelson Eddy, Merle Oberon, Herbert Marshall and many of the starlets. Aubrey Smith got up a cricket team against us and we won. We went to dances and parties and had a wonderful time. One aircraft is completely smothered with the autographs of Hollywood stars. Fourteen of the sixteen Lancasters which set off on the tour landed for the “welcome home”. The 15th was delayed at St Mawgan because of a slight defect but landed at Graveley within an hour of the others. 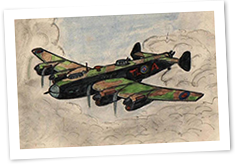 The 16th Lancaster is still detained at Gander because of an accident.